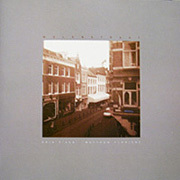 A single trip from evening to morning is chronicled on the album Molenstraat, by Eric T'Sas and Matthew Florianz. The seven pieces presented are extracts from a long improvisation, performed over the course of one night and morning in an apartment in The Hague. The tracks, named after the time of day at which they were recorded, present a rich variety of moods even as the artists work with a small palette of keyboard textures. Ripples of melody and a thoughtful piano solo open up the first and best piece, "Molenstraat 16:30". Live street noise is mixed in from time to time - shouting children, thunderclaps, and the grumble of wheels turning on the stones below. The listener drifts into deep contemplation during the blissful two tracks that begin the disk, imagining a city full of people hurrying to their homes, turning their backs on the dusk and thinking of sleep. "Molenstraat 19:28" moves into darkness, a somber piano phrase couched in dark, threatening drones. Through careful melodic twists and turns, the nighttime segment of the album imparts the emotions of a long and sleepless night - introspection and languor with pieces of fear and loneliness. Melodic themes from the start of the disc return on the uplifting conclusion "Molenstraat 07:33" - the distant ringing of bells tell us to get up and begin a new day. Molenstraat gives the listener a sparse and beautiful assortment of music, played with restraint, crystallizing a place and time in our minds, even though it may be far away.